This great tool is a must for your garage. Portable, hands-free alignment can be done quickly and easily with the FasTrax Adjustable Camber/Caster Gauge. Includes gauge and wheel mount (fits most wheels from 13” to 18”). Displays Camber ±4° / Caster -4° to +12°. Simply lower toe arms and insert tape measure into slot. Then measure to opposite tire reference point for accurate and fast toe readings. Includes 2 arms and reinforcement blocks that install easily onto either the 91000 or the 91010. Inexpensive, portable and very accurate. Return a strut to its original camber after repair or replacement. Measure camber change movement before reinstalling alignment heads during camber kit installation. Check the amount of camber change before reinstalling tire and wheel assemblies on trucks receiving offset alignment bushings. Save time and money with an ingenious tool. 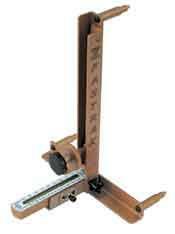 This angle gauge is an easy, accurate way for measuring frame and drive shaft angles. An ideal tool to ensure the drive line angle is still within specification for raised and lowered vehicles. Alignment equipment manufacturers are using frame angle input with their software for completing Caster specifications. Features the broader ranges (Caster +14°/-6°, Camber +8°/-8°, SAI +20°/-20°) necessary in today’s new vehicles. This gauge is made with precision workmanship and quality materials. The housing is made of durable die cast aluminum. The multi-pole ALIGNCO MAGNET, with built-in cutting teeth, removes burrs on the hub surface. Levels are recessed to prevent breakage. Fits all cars and light trucks with wheel diameters up to 20 in. This rim adapter is used when the hub is inaccessible. The adapter easily attaches to the rim, using built-in thumb screws, to provide a machined surface for accurate measurement of caster, camber and steering axis inclination. Spring-loaded gauges easily adapt to a variety of tread widths in order to give fast, accurate toe readings.